Mil Lel student wins local Scratch Competition! Congratulations to Holly for her outstanding Scratch project, titled Blue Lake, which won first place in the recent Limestone Coast Scratch competition. Scratch is a programming language that allows its users to create games, animations and interactives stories. Scratch is also an online platform where users can share and “look inside” one another’s projects, easily learning from each other. There are more than 6 million shared Scratch projects on the Scratch website! Holly spent many hours designing a complex Scratch project that featured the Blue Lake (one of the competition’s requirements). One of Holly’s mini-games works similarly to a Wii game, with the program recognising motion from the player (through the webcam), and responding to this motion. Holly was careful to include media in her project that she had created herself, for example she used some music composed on the app Garage Band. 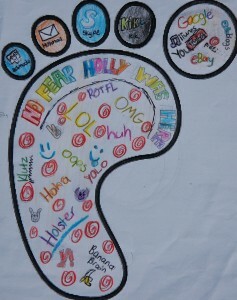 Well done for respecting copyright, Holly! Congratulations to Glenburnie Primary School, whose entry came second in the competition, and to Mundulla Primary School, who placed third. The links to the winning entries can be found on the Limestone Coast Scratches website. When we create new content such as a PowerPoint presentation, a poster for a history assignment or a new post for our blog, it is important to understand that we can’t just copy any images we want from the Internet and insert them into our work. Such images – whether they are photos or drawings – are protected by copyright. To use these images without permission is illegal. Fortunately, many images can be found on the Internet that were created by people who are happy to make their work available to the public. Creative Commons is a non-profit organisation that provides authors with licences to share their work in this way. We can use images with a Creative Commons licence as long as we attribute the image. To attribute an image means adding a caption to state the name of the image’s author and the source of the image – where it comes from. 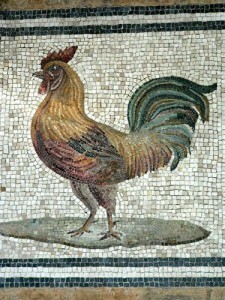 Here is an example of an image I found on FlickrCC. I might like to use this image when planning a presentation on Roman Mosaics. Notice how the image is attributed to its author in the caption. 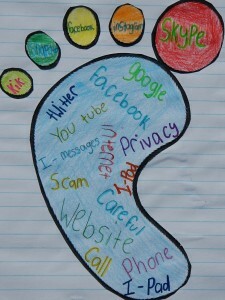 For more information about digital footprints and how to keep them positive, visit Cybersmart and CommonsenseMedia. 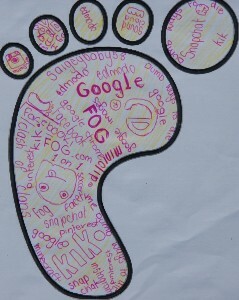 This week our class has been learning about digital footprints. 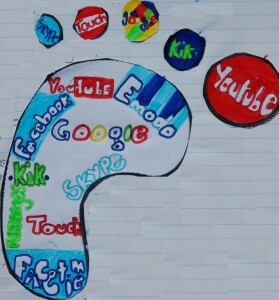 A digital footprint is a mark and record of where you have been on the internet. For example which videos you watch, what you search, the photos you upload or the comments you make: it all leaves a mark. 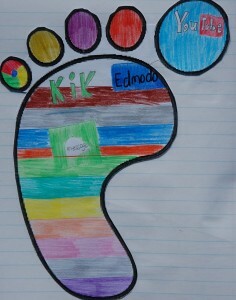 We have been making our own digital footprints. 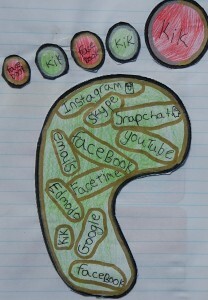 We first got handed out an outline of a footprint, and then we had to draw the icons of social media apps that we use (e.g. 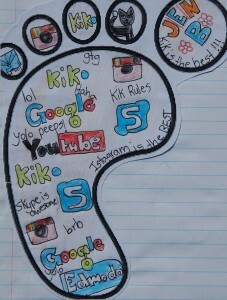 YouTube, Kik and Face time). 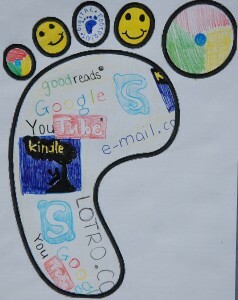 The paper footprints represent our digital footprints, or the traces we leave behind when we go online. 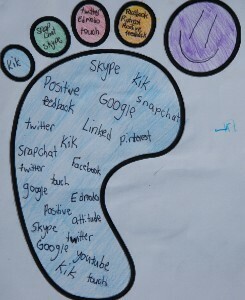 Then we learnt how we could make sure that the digital footprints we leave online are always positive. 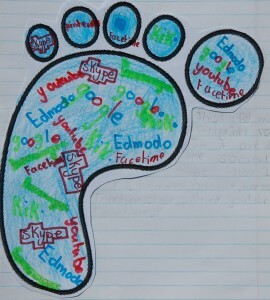 Jennieva: It teaches children how to use websites usefully, and it is a great artistic creation. Jake: it was very helpful. 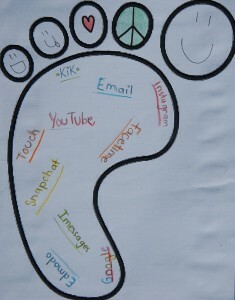 It is a great activity to do if you don’t know how to leave a positive footprint. 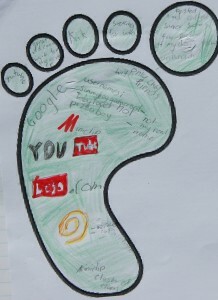 Hamish: I think that a digital footprint sums up what you can and can’t do and it teaches us what we should post and how to comment on the internet. 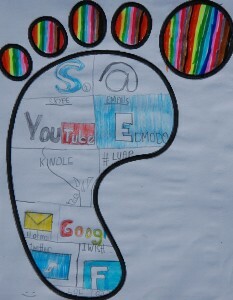 Zoe: The digital footprints are good, it is a good way to teach other kids to be safe on the internet. Jack: it was helpful and I learned something new. 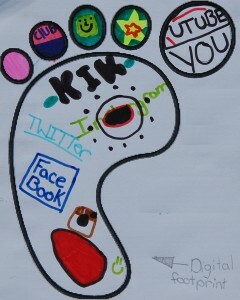 Nikki: it was fun making the digital footprints. I also like that it is all about us. Saige: it is very good to learn what stuff not to use and the stuff to use. Holly: it is food for thought that other people could track your activity on the internet.